L-Tron is a proud to support Law Enforcement Officers throughout the country by celebrating National Police Week 2017. The National Police Week 2017 kicked off Monday, May 8th and runs through Tuesday, May 16th 2017. Although police week is celebrated nationwide, with each city or community putting on their own events, the largest celebration of police week takes place in Washington, DC. Special events include the Police Unity Tour and the Annual Candlelight Vigil in memory of fallen Officers. The purpose of the Police Unity Tour is to both raise awareness of Officers who have died in the line of duty, as well as to raise funds for the National Law Enforcement Officer’s Memorial and Museum. The Police Unity Tour now boasts over 2,200 members all riding to meet in Washington DC, and raised $2.5 million in 2016. L-Tron is proud to support local Law Enforcement Officers. 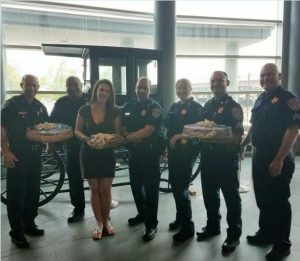 L-Tron team members will be delivering cookies to the Rochester Police Department at the end of Police Week. Additionally, we will be donating cookies to a local organization in memory of one of our fallen Officers. Recently, L-Tron coordinated a Cuddle Bear Drive, donating teddy bears and books the RPD. These books and bears will be available for Officers to give to children they meet on traumatic calls – improving the relationship between Officers and the community. We are proud and honored to continue to “Back the Blue” within our community and throughout the country.